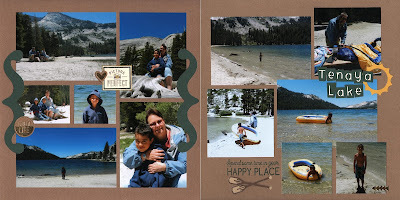 Every time we go to Yosemite, we try to spend a day at Tenaya Lake. It's beautiful, and the water tends to be a little warmer than in the Merced River (at least in our experience). I used a sketch from Stick It Down to scrapbook the pictures of our time there in 2012. To be honest, I adapted the sketch quite a bit, but I think you can see how I retained the grid pattern on the left page and a more free form look on the right with the title and a circle. I mixed a few discontinued products from CTMH with the new items I just received, and I even made myself go with the background color of the trees for my title and accents rather than the more obvious blue, but I like how it turned out. Hopefully you all do as well! Wonderful double layout! Thanks for joining us at Bitten by the Bug 2. We have a new challenge that started today. Hope you'll join us again! Cheryl, what beautiful photos. That looks like an amazing place...wonderful landscapes. I think you've done a wonderful job adapting the sketch to fit your photos. Gorgeous page. Love how you made the sketch your own. Thanks for playing along with us at Stick It Down. It looks like you had a great trip, the photos sure tell the story. Thanks for joining us at Stick it Down. Super layouts, and all the photos in the layout certainly will bring back many memories for years to come. Thank you for sharing your scrapbook layout at Heart2Heart. Great layout, I love it! Thanks for playing along with Heart 2 Heart Challenges (H2H).